Booking requests can be made by telephone, e-mail or via our website. Please note that a binding booking only exists once we have confirmed the request. 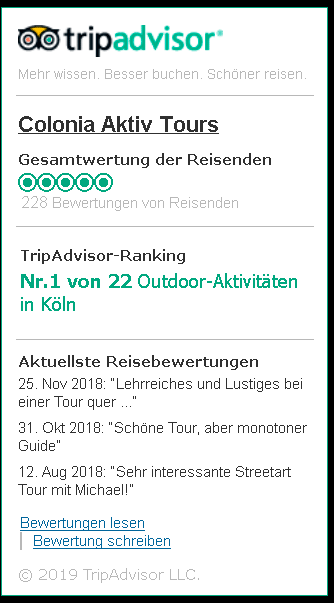 We offer you various guided bike tours through Cologne. The description of the individual tours can be found on our website or in our brochures. We are also happy to create a bike tour tailored to your personal wishes. For the tours we provide rental bikes, which are included in the price. For the use of the bicycles the conditions for the rental of bicycles apply additionally. The remuneration is due upon conclusion of the contract. -If the tour starts earlier than 7 days before the start of the tour, 25% of the agreed price must be paid. However, it is possible for you to prove that we have incurred less or no damage in the individual case. Then only the actual damage caused by the cancellation is to be paid. Participation in the tours is at your own risk. We regularly check the condition of our bikes. Nevertheless, you are obliged to check the road safety and functionality of the bikes when you take them over. During the tours you are responsible for road safety and for your own fitness to participate in road traffic. We assume no liability for damages. This does not apply to injuries to life, limb and health and to damages caused by intent, gross negligence or breach of essential contractual obligations on our part. A valid identity document is required for the conclusion of the rental agreement. A digital copy is made of this ID document. This will be deleted by Colonia Aktiv shortly after termination of the contract. The rental prices are published on the website www.colonia-aktiv.de and through price tables in the shop. The tenant must convince himself of the operational safety when accepting the bicycle and report defects independently. An extension of the rental period is possible, but must be agreed with Colonia Aktiv. Without an agreement at least the price according to number 2 will be charged. With loss of orders due to a late return of bicycles Colonia active can make claims for damages valid. We assume no liability for damages. This is not valid with injuries of life, body and health and with damage, which is based on resolution, rough negligence or the injury of substantial contract obligations on our part. The renter is liable for loss of the bicycle or individual parts. A cleaning fee may be charged for heavily soiled bicycles. The luggage racks are not suitable for transporting a second person. The renter is liable for personal injury or damage to the bicycle. Damage to the bicycle must not be repaired by the renter. All damage must be reported immediately to Colonia Aktiv. 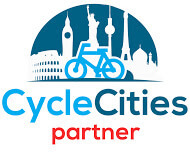 Colonia Aktiv provides for the collection of the damaged bicycles in the Cologne city area and compensates the customer at least with the credit of a rental bike for the lost rental period. With my signature I confirm the above mentioned conditions for the rental of bicycles.